Based on the novel by James Leo Herlihy, Midnight Cowboy is the story of a Texan hustler who works with a con man in the street of New York City where they deal with its decay and adversity. Directed by John Schlesinger and written by Waldo Salt, the film explores the friendship between two different men as they struggle to survive in the dark world of New York City. Starring Dustin Hoffman, Jon Voight, Sylvia Miles, John McGiver, Brenda Vaccaro, Bob Balaban, Jennifer Salt, and Barnard Hughes. Midnight Cowboy is a captivating and exhilarating film from John Schlesinger. The film explores the friendship between two very different men as they struggle to survive the bad part of New York City where they’re ostracized for being different. One of them is a hustler from Texas who arrived to the city on a bus with the hopes to make money by bedding lonely rich women. Instead, Joe Buck (Jon Voight) finds himself dealing with the reality of his situations as he is accused of being gay because of his cowboy outfit as he gets the attention of a crippled con-man in Enrico Salvatore “Ratso” Rizzo (Dustin Hoffman) who tries to con Buck yet the two would team up as Rizzo would become Buck’s manager. Yet, they would face lots of adversity as Buck and Rizzo would do whatever to survive and hope to get their hustling business started as well as the desire to move to Florida. Waldo Salt’s screenplay has a unique structure where its first act is about the hopes and dreams of Buck wanting to go to New York City in his cowboy get-up. Along with a suitcase full of cowboy clothes and such, he’s also carrying emotional baggage from his past as he is haunted by some of these moments. It would serve as motivation for his need to succeed in New York City where he knows that he has an agile body and the ability to pleasure women. Unfortunately, Buck’s idea of being this aw-shucks cowboy who is quite gentlemanly towards women has become passe where he only attracts the attention of gay men. Through meeting Rizzo, Buck would be able to survive the city a little big longer as Rizzo is a con-man with a lot of street smarts. Though he often walks with a limp and looks very dirty but he sees some potential in Buck despite the cowboy get-up. Salt’s script would also include some dialogue that would play into the drama as well as this unlikely friendship between Buck and Rizzo where the latter tells the former that the cowboy get-up is worn out and that anyone who wears that crap is gay. Buck would be baffled as he couldn’t believe that idea since John Wayne is a cowboy and straighter than anyone. It is part of Buck’s naivete about the ways of the world he’s in yet he and Rizzo do have dreams of living the good life in Florida. Yet, their adversities are often due to Buck’s naiveté as well as some misunderstanding and such where its third act would have the two at a party which would play into some major after-effects. Especially as Rizzo is already ill as he constantly coughs that would later worry Buck. John Schlesinger’s direction is quite stylish in the way he presents some of the film’s dizzying flashbacks as well as some of the misadventures Buck would have in New York City. Much of it is told in this frenetic style of sorts where there’s a lot of hand-held cameras and strange sequences as it plays to a world where Buck has no clue into what he’s in as if he is an alien. Though things start off in a more light-hearted fashion where Schlesinger shoots Buck in an optimistic fashion where he is on a bus traveling from Texas to New York. There’s an intimacy to some of these compositions as well as how Schlesinger would frame Buck and Rizzo in their decayed apartment that sort of acts as an extension of Rizzo’s personality and declining health. The direction would also include these very engaging scenes where New York City is a character in the film as it plays into this world of dreams and nightmare just as the city is starting to change in many ways. Much of which would baffle Buck who later learns how to tough it out where he and Rizzo would deal with cab drivers and all sorts of low-life people in the city. The flashback scenes would play into the world that Buck wanted to escape but also a world that he feels like he no longer belongs him where he and Rizzo are still searching for a place that can really feel like home for them. Especially as the film’s climax would have Buck become the engine to drive them to Florida in the hope for a fresh start. Overall, Schlesinger crafts a very compelling yet eerie film about two men surviving the streets of New York City. Cinematographer Adam Holender does excellent work with the film‘s different photography styles with its vibrant use of colors in some of the exterior and interior settings along with some black-and-white stuff for a few flashbacks and dizzying sequences as well some grainy camera shots for a party scene. Editor Hugh A. Robertson does amazing work with the film‘s stylish editing with its use of jump-cuts and dissolves to create some montages that are quite dizzying and hypnotic to play into the strangeness that Buck would encounter. Production designer John Robert Lloyd and set decorator Philip Smith do terrific work with the look of the apartment Rizzo and Buck would stay at as well as the party they go to. Costume designer Ann Roth does fantastic work with the costumes from the shirts and hat that Buck wears to the more ragged look of Rizzo. Sound editors Vincent Connelly and Jack Fitzstephens do brilliant work with the sound editing in the sound montages they create for the flashbacks as well as the scenes where Buck would be baffled by his surroundings. The film’s wonderful music soundtrack features a few score pieces by John Barry that plays into the sense of fantasy and plight that Buck and Rizzo would face well as the Fred Neil song Everybody‘s Talkin‘ that is sung by Harry Nilsson as other contributions from Nilsson, Randy Newman, and Warren Zevon to play into the crazy world of 1960s New York City. The casting by Marion Dougherty is absolutely incredible as the film would feature some early appearances from M. Emmet Walsh as a VF passenger on the bus to New York, Bob Balaban as a student Buck would meet at a movie theater, Warhol superstar Viva as a party host, Jennifer Salt as an old girlfriend of Buck from the film’s flashbacks, Ruth White as Buck’s grandmother in the flashbacks, Gary Owens and T. Tom Marlow as different versions of the young Buck, Barnard Hughes as a troubled townie Buck meets late in the film, and John McGiver as a mysterious man Rizzo would use to con Buck. Brenda Vaccaro is wonderful as a young socialite Buck and Rizzo meets at a party that would be a major deal breaker for Buck in his desires to be a hustler. Sylvia Miles is fantastic as an aging socialite Buck meets early in the film who would prove to be a lot of trouble. Finally, there’s the performances of Dustin Hoffman and Jon Voight as both of them give absolutely outstanding performances in their respective roles as Enrico Rizzo and Joe Buck. Hoffman has this air of griminess to his character that makes him quite confrontational as well as be a bit of a slime ball but there is a lot of grit into his role as he is just trying to guide Buck into surviving New York City while hiding his own ailments. Voight brings a sense of charisma to his performance as this naïve Texan who wants to hustle but finds himself in a world that he doesn’t know. Hoffman and Voight have great camaraderie in the way they display their friendship as well as their differences which adds to the film’s brilliance. Midnight Cowboy is a tremendous film from John Schlesinger that features riveting performances from Dustin Hoffman and Jon Voight. The film is definitely a very provocative yet mesmerizing film that explores two different men trying to survive the harshness of New York City in its most chaotic. Especially as it’s also a film about loneliness and a world where two men feel out of step with that world. 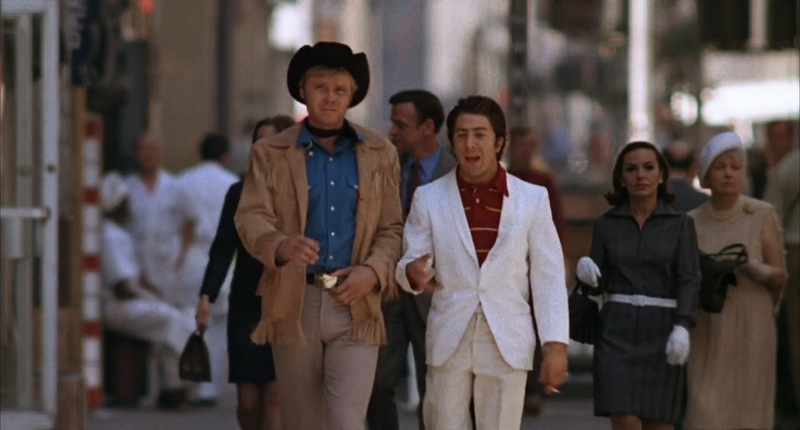 In the end, Midnight Cowboy is a phenomenal film from John Schlesinger. This was one of those films I had a feeling I'd find overrated...and then I didn't, because it IS that amazing. Great review...hit every nail! Thank you. It is one of those great films that deserve to win Best Picture though I think The Wild Bunch was the best film of that year.